Mackenzie Jones reached 100,000th follower on Linkedin in June! We thought it would be worth celebrating with the Mackenzie Jones, Mums@Work and MENA teams. Congratulations to the follower Lisa Ramshaw, Senior Manager – Professional Learning & Development at GEMS Education, who was the lucky winner of a shiny new Samsung Tablet and some goodies from Linkedin. 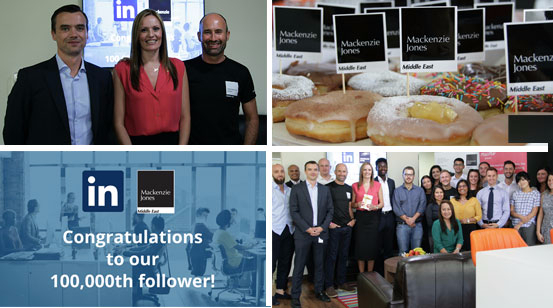 We invited Lisa and the Linkedin team to the Mackenzie Jones offices to present the prize and mark the occasion with a mini Iftar of tea and doughnuts with Mackenzie Jones team. Follow us on Linkedin for regular updates on jobs, articles and, you never know, you may win next time!